This week on the Sales Hacker podcast, we talk to Jamie Scarborough, Co-Founder of the Sales Talent Agency, one of the largest sales recruitment firms in North America. Jamie’s team worked with over 18,000 sales professionals in 2018 alone and shares his ideas, strategies, and tips on what makes a great salesperson, how to interview, and how to properly manage your career. Sam Jacobs: Hey everybody, it’s Sam Jacobs and you’re listening to the Sales Hacker podcast. Today, we’ve got Jamie Scarborough on the pod. Jamie is one of the co-founders and partners at Sales Talent Agency, STA, which is one of the largest recruiting firms, specifically for salespeople, in Canada. Jamie understands what you need to do when you go into an interview, what you need to do when you’re thinking about your career. He also understands if you’re a hiring manager, if you’re a sales manager looking to build your team, some things that you need to think about. Now, of course we want to thank our sponsors before we deeply dive in. The first is Chorus.ai. Chorus is the leading conversation intelligence platform for high growth sales teams. It records, transcribes, and analyzes business conversations in real time to coach reps on how to become top performers. We also are always sponsored by Outreach, the leading sales engagement platform. 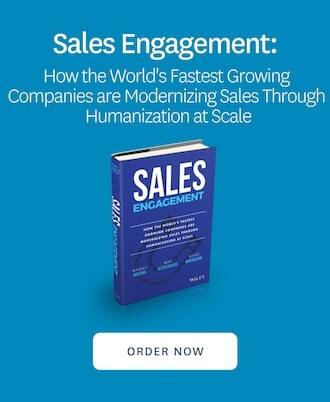 Outreach support sales reps by enabling them to humanize their communications at scale. I suppose that means dropping authentic pieces of information into email communication as opposed to always looking like a Bot. In March, Outreach is running Unleash 2019. It’s going to be the definitive great new sales engagement conference and is going to take place March 10th through 12th in San Diego. Listeners of the podcast, $100 off simply for entering the code “SHPOD”, so hop over to Outreach. Without further ado, let us listen to Jamie Scarborough on the Sales Hacker podcast. Sam Jacobs: Hey, everybody. It is Sam Jacobs. We are really, really excited to have a different type of guest today, we’ve got Jamie Scarborough. Jamie is important for a number of different reasons, but let me give you his quick background. Jamie is a founding partner at Sales Talent Agency, one of North America’s biggest and most prolific sales recruitment companies–they interacted with more than 18,000 sales professionals in 2018 alone. He’s also a featured expert for profit guide in the areas of sales, leadership, and recruitment strategy. Jamie runs one of the largest and most successful recruiting agencies specifically for salespeople in Canada. Jamie, welcome to the show. Jamie Scarborough: Thank you Sam. Nice to chat to you. Sam Jacobs: Walk us through the path to starting your own business, and what you were doing before and what the impetus was to become an entrepreneur. Jamie Scarborough: I always wanted freedom, and my whole life, that’s been my driving force. I wanted to have enough money where I didn’t have to rely on anybody else. And so I would take jobs–at the age of 14, I was working in pubs. I was doing paper routes. I was selling steak knives door to door. I was working in a market store, selling rugs and carpets. Anything I could do to make money, I was happy to do, just to create a bankroll so that I had some freedom. After doing all of that for years and years, I got a job as a junior copywriter with a recruitment advertising agency called TMP. At that time, recruitment advertising was massive. I did that for years and got promoted a few times and a few years in they said, “Would you like to be a salesperson?” I gave it a try, and absolutely loved it. I was sales rep of the year for multiple years. I managed their team, met my business partner now, and then we decided we were going to start a company. We didn’t feel that there was a really good sales recruitment specific company and we just went, “We’re going to go and do it.” And so, we started, in 2007, Sales Talent Agency. What’s in the DNA of a Salesperson? Sam Jacobs: You’ve been in business for 12 years, so how’s it going and what have you learned? Jamie Scarborough: We’re on the fastest growing list, which always makes me laugh because we’re the slowest growing “fastest growing” company I’ve ever seen. Every year we’ve grown, every single quarter, we’ve grown year over year. We’re now at 10 million. Sam Jacobs: What is it? Tell us about it. So we came up with DNA PRO. We broke it down in a way that a lot of people hadn’t thought of them before. For example, everyone would say, “Yes, a salesperson needs drive.” But we often miscategorize drive as ambition. We think that somebody is ambitious, therefore they’re driven, but what we found was you needed three things to have drive in the way that we needed it. Then we said, well, drive’s not enough; we needed one who’s got a great amount of nature (emotional intelligence or empathy). You’re going to be dealing with people all the time, different kinds of people, different personality types, different career levels, different influence levels, and you need to be able to understand where they’re coming from. Finally, you need acumen. We’re in a world where we want challenges, we want solution salespeople, we want consultants. We’re problem solvers as sales people now, and we need someone who’s bright and curious. They don’t have to be a jeopardy champion, they just have to have a bright, curious mind where they’re going to become an expert at something. That’s just the DNA side and you can see that if you start digging into that, you can get really passionate about not just what it is, but how to find that in someone. What is at the Top of Your Hierarchy of Career Needs? Sam Jacobs: I want to ask you a question about career pathing for people. What advice, when you’ve got all of these young sales professionals, that you’re giving them specifically about managing their career? Have the rules changed? Have they evolved? Are they still the same? What are the common mistakes people make as they look out five to 10 years over the course of their career? Jamie Scarborough: How do you manage a career? It depends on your level, but let’s talk about someone early stages. The first thing you’ve gotta say is, “Well, what do you need? What is your hierarchy of needs? What is the first thing you need is a sales person?” And what they often forget is the value proposition. You can get so attracted to these bright and shiny companies that have a lot of money invested in them, but they actually, as a salesperson, are really hard to sell because they don’t have something that really is unique and compelling. The first thing, as a salesperson, you’ve got to look for when you’re making a decision on role is, do you have something that has an audience? And can you communicate that factor to that audience in a way that is compelling? And then you ask, “Well, is there a manager, or leader, or a coach, or an infrastructure that’s set up for me to continue to develop?” Obviously, if you’re a little later in your career, you may want more autonomy and no development, but early on, you don’t know anything. For me, the biggest mistake people make is they jump to a shiny object. They’re in a path, instead of staying in that path, someone else comes along, and they wave, “Hey, hey, hey look at this. You’ve been there for eight months, nine months, a year. Look what you could be doing, look how much they’ll pay you.” And you make that move. We feel like every career jump should be a three year minimum career jump, so that you’ve had a chance to learn something, prove something, and get a really good reference and advocate from your employer. Sam Jacobs: You mentioned that there’s a bunch of flaws in the recruiting process, what do you think is the perfect recruiting process, and how should a company design itself in order to get the best possible talent? Jamie Scarborough: I’m going to just go through the whole process. – That’s great, but good candidates have choice. How can you attract those good candidates to your business? Choose – Use that DNA PRO process. That doesn’t mean that solves your problem, it’s just the ingredients. Equip – You’ve done all this work. You’ve worked really hard to build an environment that attracts them, you’ve looked at your compensation, you’ve done everything. You’ve gone and you’ve analyzed them based on DNA PRO and now you’ve got to equip them for success. You’ve got to put them in a spot where that Maslow’s hierarchy of sales needs is actually provided. What do they need that they don’t have right now to be the best version of themselves, so that they’re not only performing at a higher rate, but they’re also happy here? Sam Jacobs: Everybody, it’s Sam Jacobs and this is Sam’s corner. We really enjoyed speaking with Jamie Scarborough. I took away a couple things that we’ve heard repeatedly on the pod. STA, Sales Talent Agency, the company that Jamie runs, they’ve developed this thing called DNA PRO. We talk a lot about qualities that make a great salesperson. I want to focus on on drive, about the will to sell commitment, responsibility, outlook, and accountability and desire, but Jamie frames it as not just ambition. His point is, it’s not just about wanting something big for yourself, it’s what are you willing to do to get that. Also, echoing Denny Hertzberg (and a bunch of other people), hiring managers want to know what are the goals that you’ve set, and how can you demonstrate that you’ve achieved them? Why are those goals interesting to you? Why do they motivate you? Why do they challenge you? I think that’s something else that’s interesting. This has been Sam’s corner.